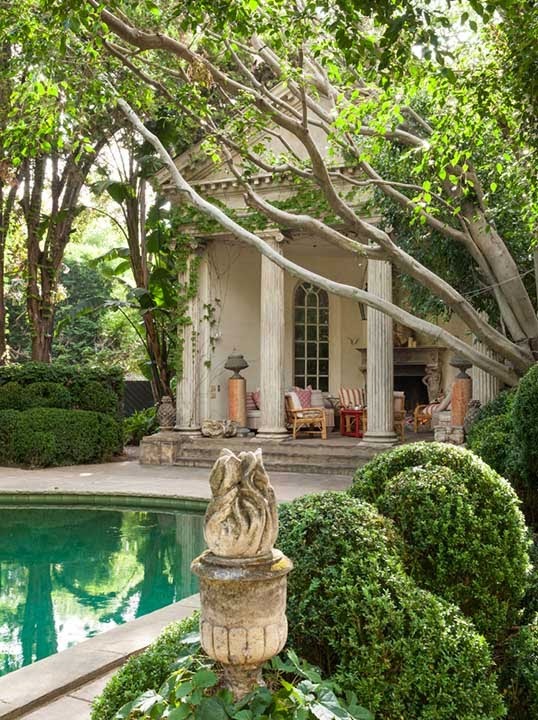 In Los Angeles, the noted designer/antique and art dealer Richard Shapiro has shaped a surreal secret garden with rare botanical species, sculpted box, and a trompe l’oeil Palladian villa for luxurious repose. 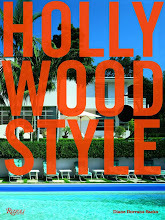 I presented Richard’s Malibu beach house on THE STYLE SALONISTE and it’s one of my most all-time popular blog posts which you can see by clicking here. 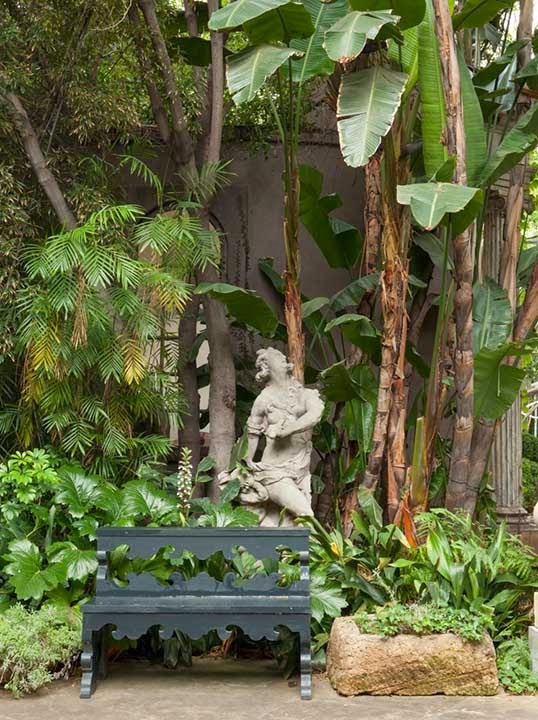 Here is Richard at home in a hidden corner of Holmby Hills. 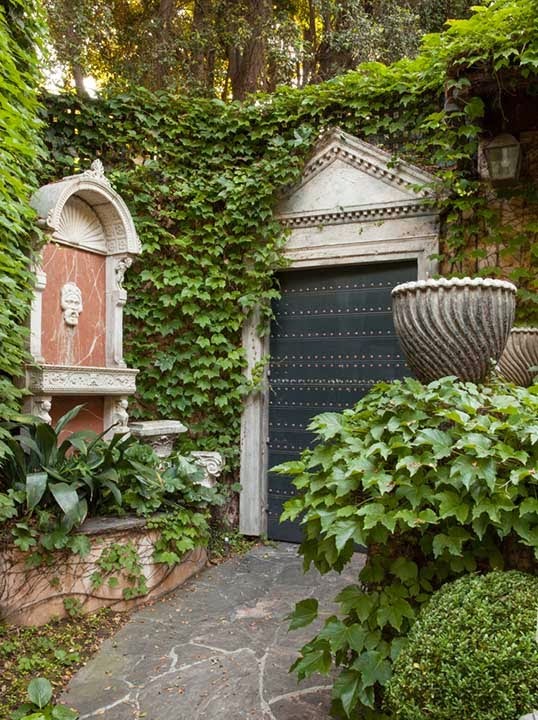 This garden has been his obsession for over two decades. 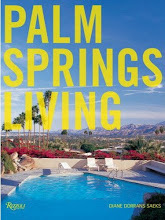 I know you will love this highly original and ultra-private garden, and Richard’s fascinating private world. 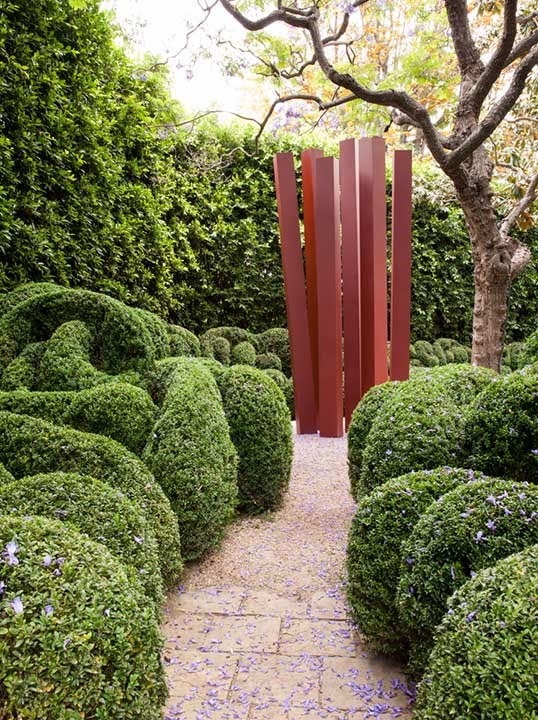 But it’s Shapiro’s surreal boxwood garden, inspired by the abstract hilltop gardens surrounding the Chateau de Marqueyssac in southwest France that is his theatrical tour de force. 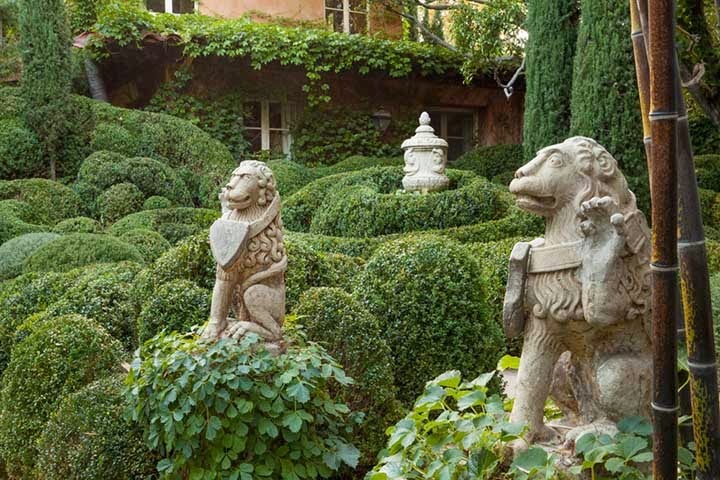 “On an annual tour through the Dordogne ten years ago, I visited the fifteenth-century Chateau du Marqueyssac and marveled at its endlessly swirling and surreal boxwood sculptures,” recalled Shapiro. 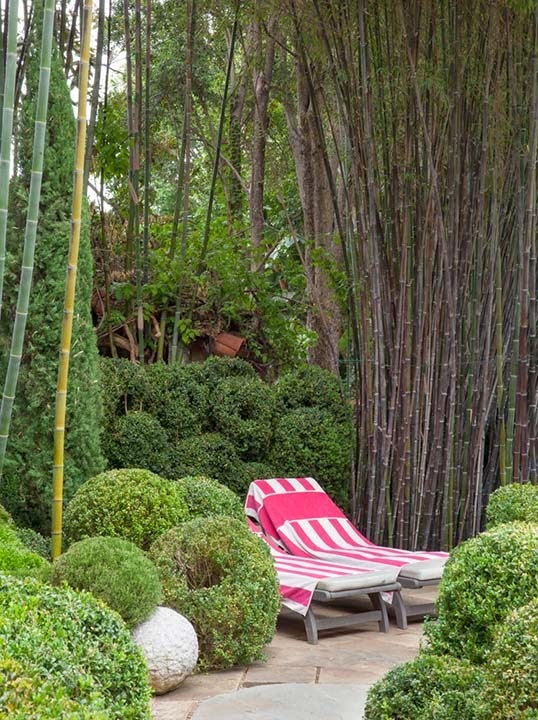 He had started designing his garden about 26 years ago, as a labor of love. 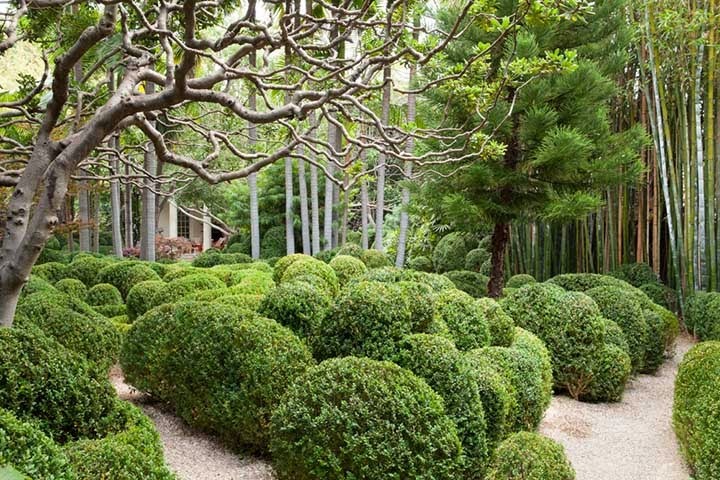 In a kind of frenzy, he dug up the lawn, and planted the first hundred boxwood plants in the ground nine years ago. 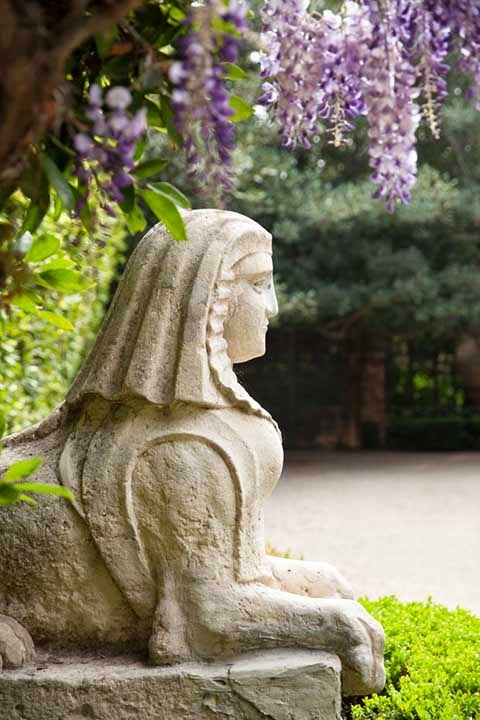 The 17th-century chateau garden, his inspiration, was originally planted by a pupil of André le-Notre, the designer of the Versailles gardens. 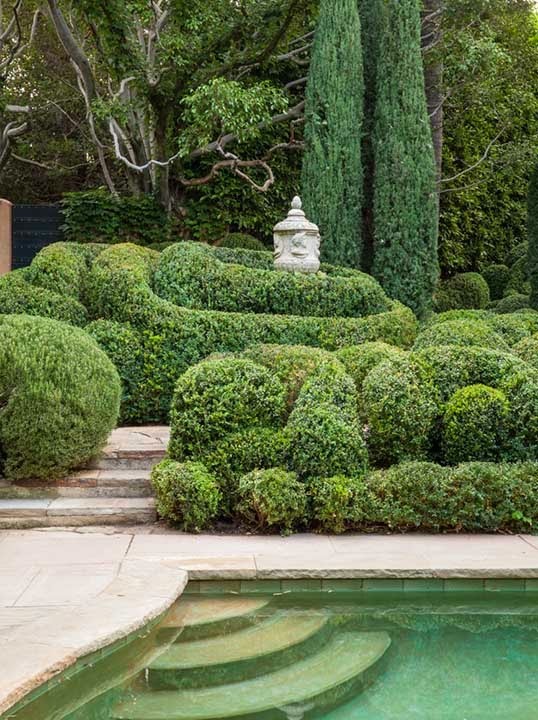 Acres of box topiaries are clipped in abstract shapes. It can be visited today. 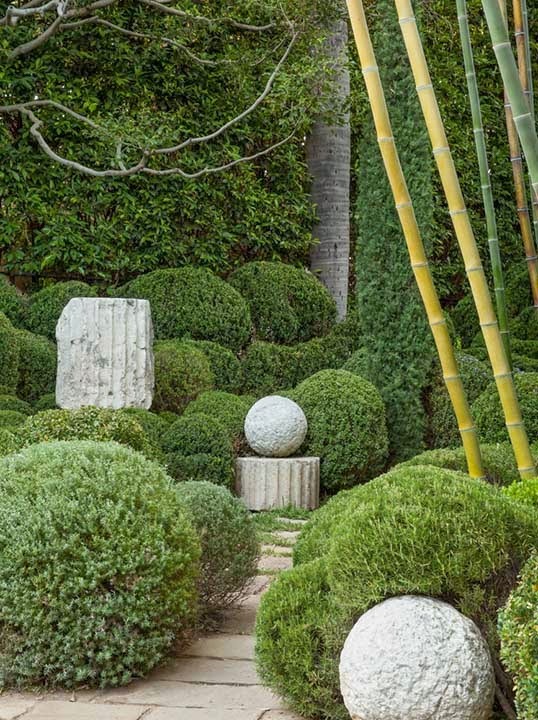 “I returned home and began researching buxus sempervirens—known as box,’ said Shapiro. Some of his plants are acquired fully grown from a specialist nursery; others are just a few tender branches. 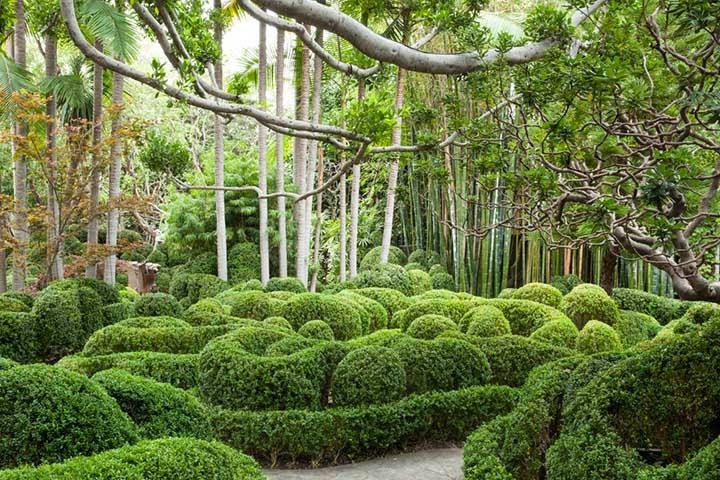 He planted the box, and then hand carved them into a maze of undulating cloud-like forms. Shapiro conceived the entire clipped box sculptures and does all the shaping and shearing by hand with Japanese shears and clippers. More are added every year and his skill at creating new effects grows each year. “It is very spontaneous and unplanned,” said Shapiro. 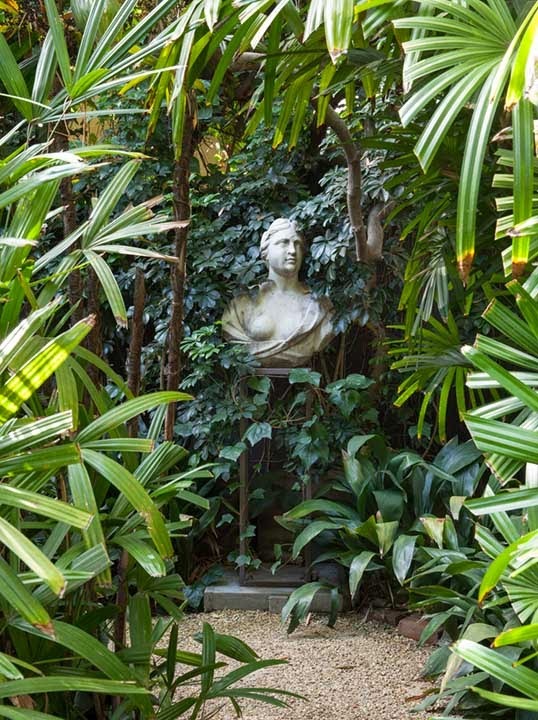 The evergreen garden, tranquil and shaded, doesn’t change from season to season. A burst of light green new growth and the beauty of wisteria and jacaranda blossoms herald the spring. 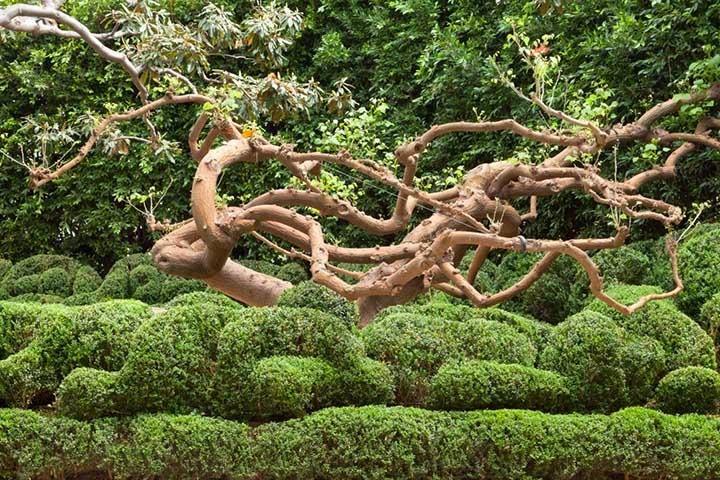 There are juniper trees to create a curtain of green background. 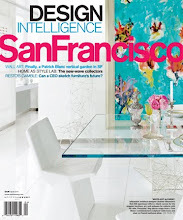 Boston ivy covers most of the walls of the studio, where the designer crafts new collections and meets clients. Shapiro planted Eugenia to secure the tall property line hedges. 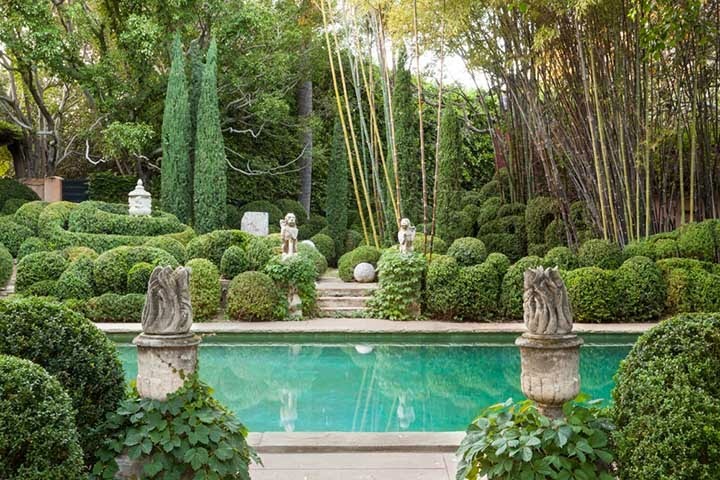 An impenetrable perimeter of trees, hedges and foliage entirely obscures the house and garden from the exterior. He uses a variety of hand shears and arcane tools. Heavy-duty American versions go into action for rough work, and lately he has been using very sharp Japanese clippers. “With these shears, the sculptural possibilities are endless, very precise, and rapid. Gratification is instant,” said Shapiro. 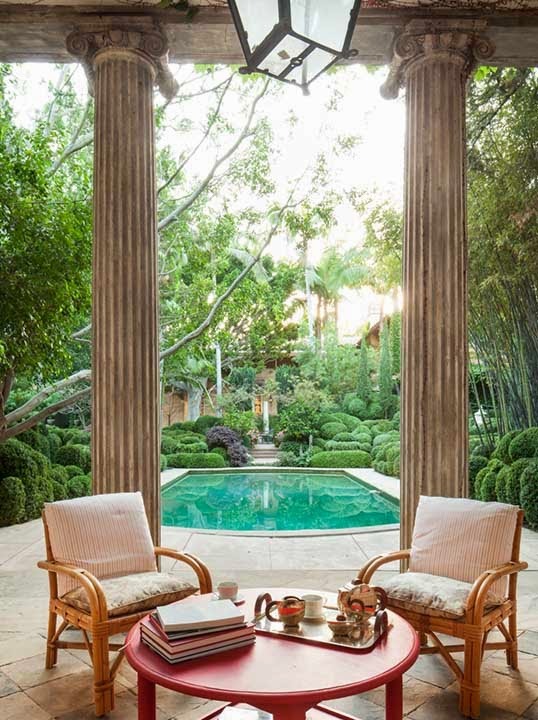 Over the next few years, Shapiro obsessively covered every square foot of a former lawn with this material, creating vast and wavy vistas in every direction, like a flock of green sheep roaming his land, when viewed from the residence. 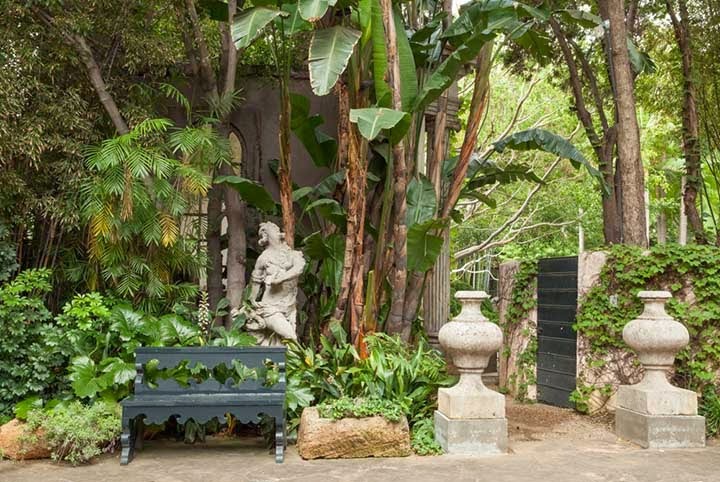 He also planted exceptional specimen trees and shrubs, including Italian Cypress, Ficus Nitida, King and Queen palms, and fragrant Pittosporum, Schefflera actinophylla, Podocarpus Henkelii, with its elegant slender leaves, as well as Jacaranda, Norfolk Pine and Raphis Palm, a dramatic fan palm. 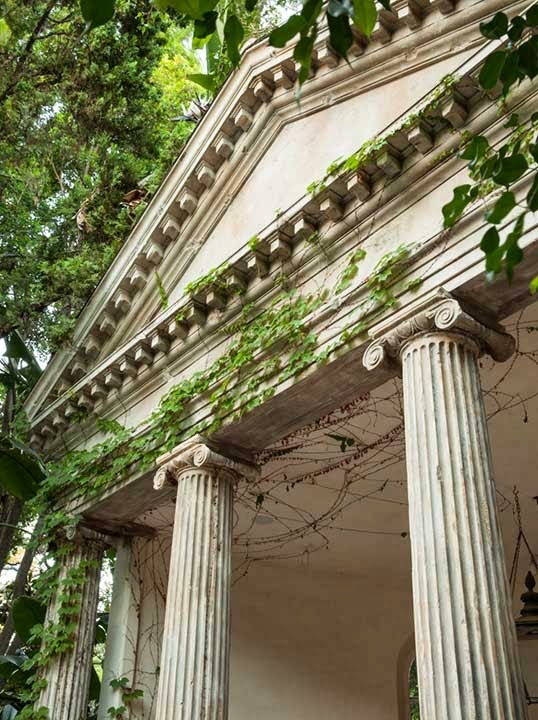 Shapiro’s petite pool house (it is just ten feet deep) is a copy of the portico at Palladio’s Villa Chiericati in Vicenza. He discovered the 16th century architect’s original construction drawings of the structure in a book from his private library. 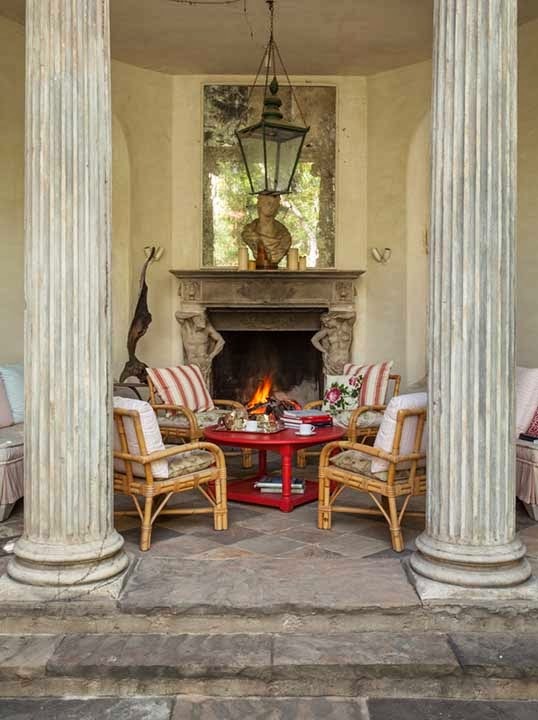 Shapiro executed the plans in weather-resistant redwood and then eroded and patinated the surfaces with plaster, lime and varied pigments to simulate ancient stone and to give the portico and the entire scene an authentic antique appearance. 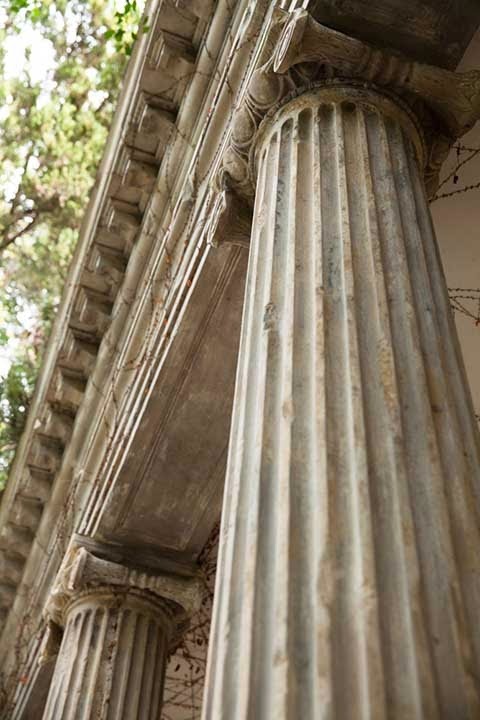 Shapiro executed the plans in weather-resistant redwood and then eroded and patinated the surfaces with plaster, lime and varied pigments to simulate ancient stone to give the portico and the entire scene an authentic antique appearance. 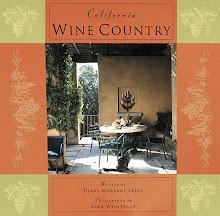 It’s furnished with weather-faded furnishings, to appear old and worn and well used. 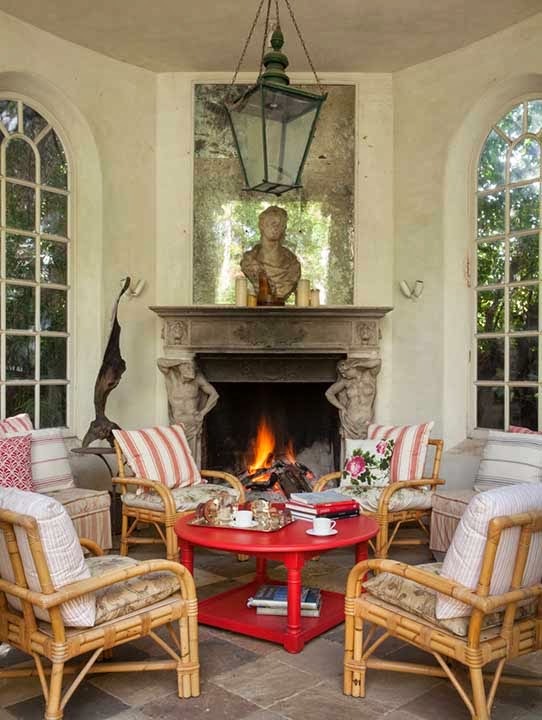 It’s the perfect hide-away for festive apéritifs in the evening, as a setting for a quiet summer lunch, or even for an early supper on a winter evening with the fire blazing and darkness settling over the trees. But it’s the sculpted box that has become Shapiro’s obsession. Shapiro said that his lifelong immersion in the world of art had taught him to see everything as art, or at least as the fodder for art. It’s silent here in his verdant domain. He can work for hours, his artistic instincts and imagination taking over. For him, it’s sculpture, creation, expression. 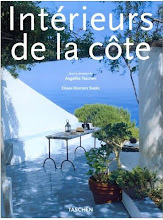 “My garden, it is now obvious, is my art project, endlessly captivating and inspiring, ” he said. The primary objective—that of total creativity and isolation—has been achieved. 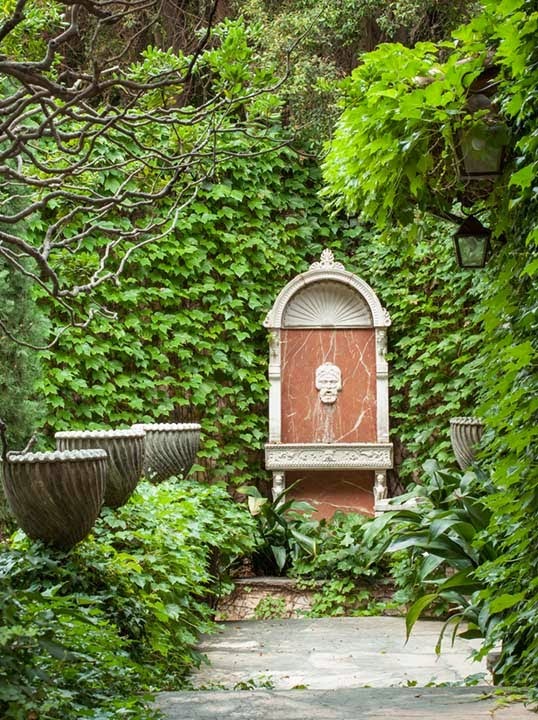 Contemporary and antique sculptures are a dramatic counterpoint to the green garden panorama. 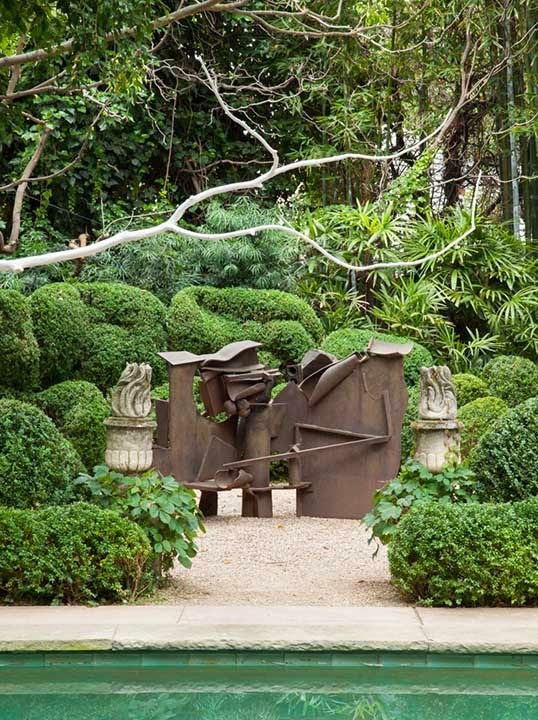 A welded steel sculpture by Sir Anthony Caro has developed a rusted finish. 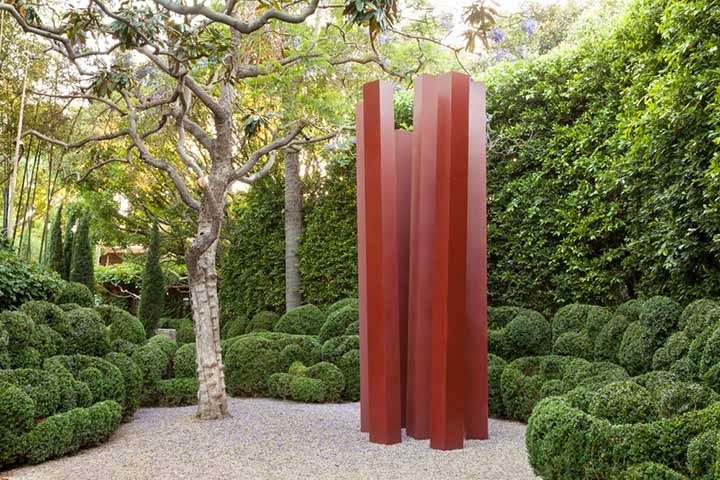 Richard Shapiro designed the dramatic monumental steel sculpture, “The Red Forest”. 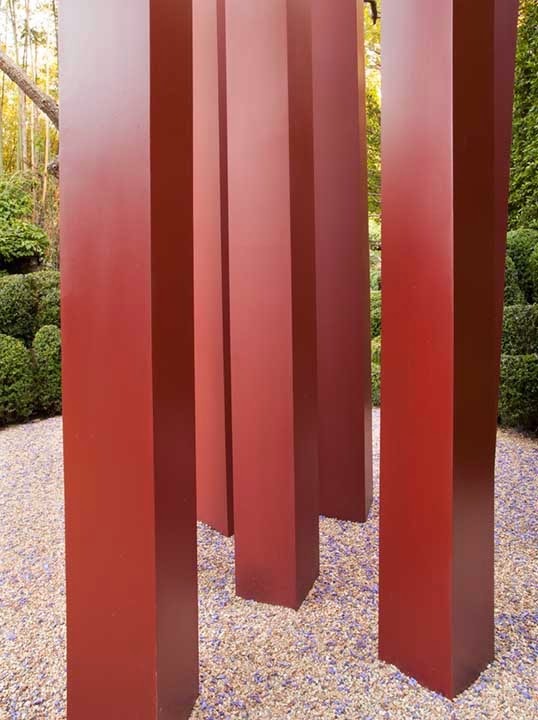 Seven 18’ tall steel columns, painted red, emerge from the earth at random angles. Richard Shapiro’s Studiolo line of furniture is sold in eight showrooms around the country, www.richardshapirostudiolo.com. 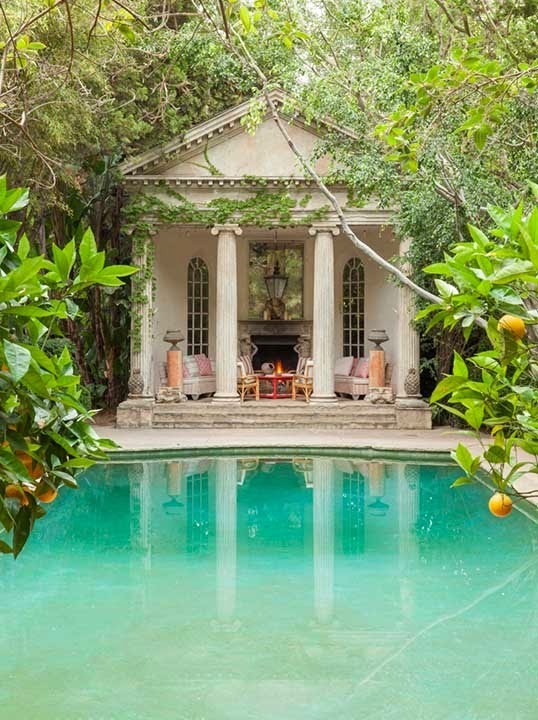 Or by appointment at his Holmby Hills studio: 310-275-6700. DDS: Next collections in the works? RS: I am now working on a collection of teak furniture, which will be very minimal and sculptural and suitable for both interior and exterior. Additionally I am always sketching designs for various pieces of furniture, almost always with a contemporary take on a classic design. Yes, Studiolo. All the new pieces are for Studiolo and will be released when ready...maybe 6 months. Sculptor Ulrich Ruckriem created a massive sculpture of two quarried stone monoliths, each weighing six tons. 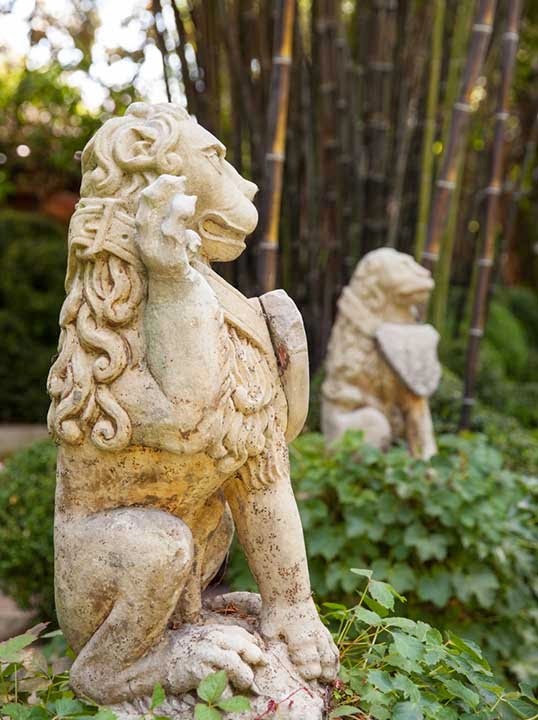 Throughout the garden are classic sculptures, including ancient torsos, Roman and French column fragments, capitals, Romanesque lions, 16th-century Florentine lions, an 18th century stone bust, and stone urns. 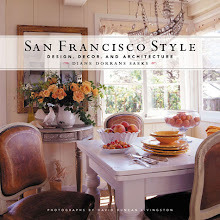 All photography by the great Lisa Romerein, www.lisaromerein.com. 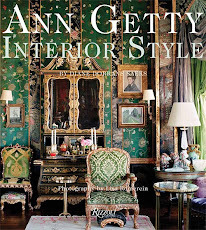 Lisa Romerein is the superb photographer for memorable images in my most recent book, ANN GETTY INTERIOR STYLE (Rizzoli, 2012). 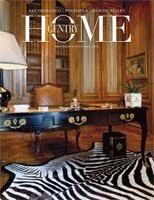 Her work is also featured in recent issues of House Beautiful. All photography by Lisa Romerein used here with express permission. All of her images are copyright Lisa Romerein and may not be used without written permission of the copyright holder. Every garden needs a color trinity. Green/brown/white is the classic. Of course it's here. Proof, too, green is a color in the garden. Had to laugh when he said how 'instant' the pruning results are!!! Yes…imagine that Richard has been working on it for several decades. That's what it takes to get the density and editing and dept of green. I admire also the rare trees and his editing…he has done far in this journey. There is such a lesson here--for designers and architects and everyone in design. I knew you would love it, and get it. Yes…the key here is that it is all green…and I did not state the totally obvious that there are now flowers here…and I did not quote him stating the totally obvious…he did not plant a single flower. There is no color. GREEN AND WHITE…and really, just SHADES OF GREEN. 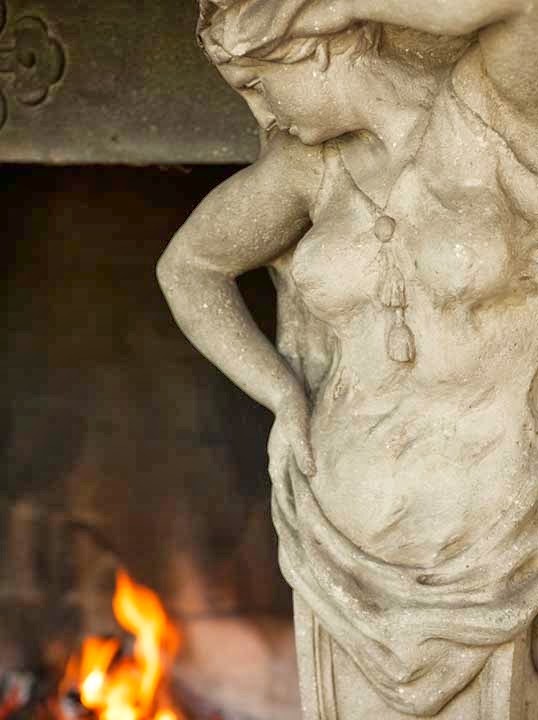 3. his fantastic modern sculptures…presented so well. 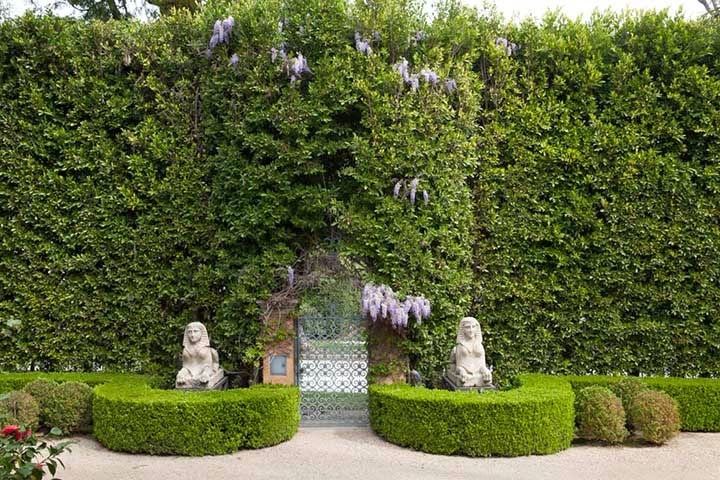 4. that it is a relatively small garden…that you cannot see walls or fences…it looks as if it goes on forever. 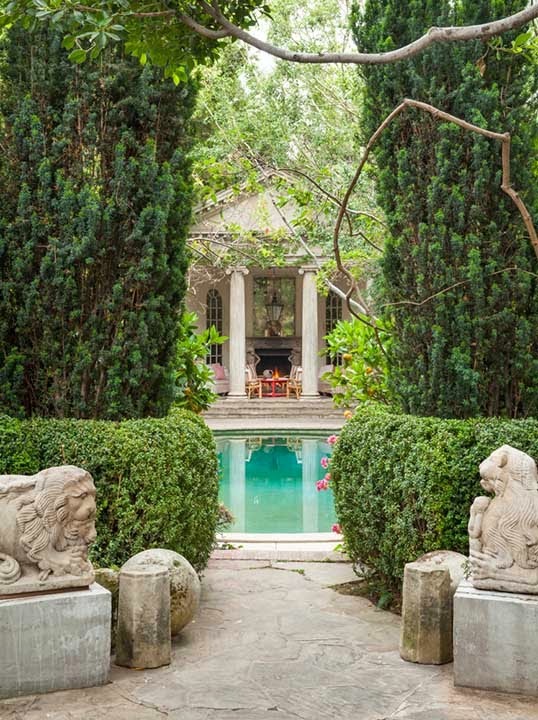 5. the folly…villa…is about ten feet deep..also fools the eye. 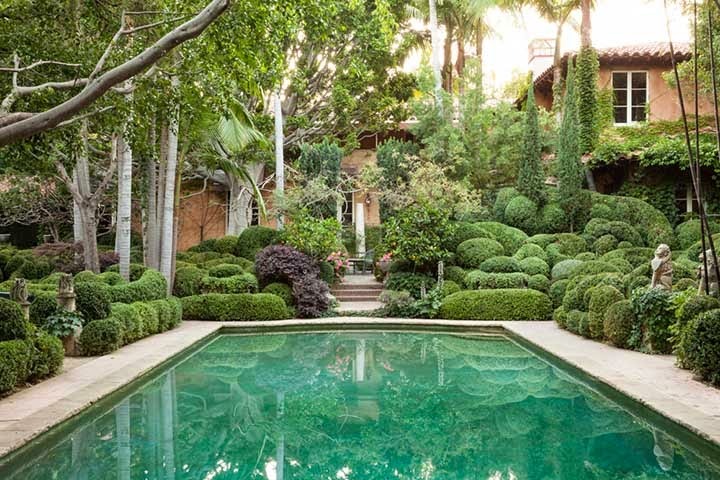 What an absolutely magical garden! One could easily lose oneself and never return to the real word among the treasures that form this landscape. Thank you for bringing it to our attention. I think we are neighbors…and hope to meet you before too long…or sooner. Yes, it appears we are neighbors and it would indeed be a pleasure to meet you in the not too distant future. Diane: Your posts are always so well written and informative except I've never understood your lack of proofing before posting. Someone with your expertise must want the very best in their work to be presented. The lack of proofing before you post simply detracts from what is otherwise the finest out there. I proof for a living and notice such things but feel certain others do too. Content and subjects are excellent! I could move right in……….really GORGEOUS! Beautiful! The garden but particularly the pool area. 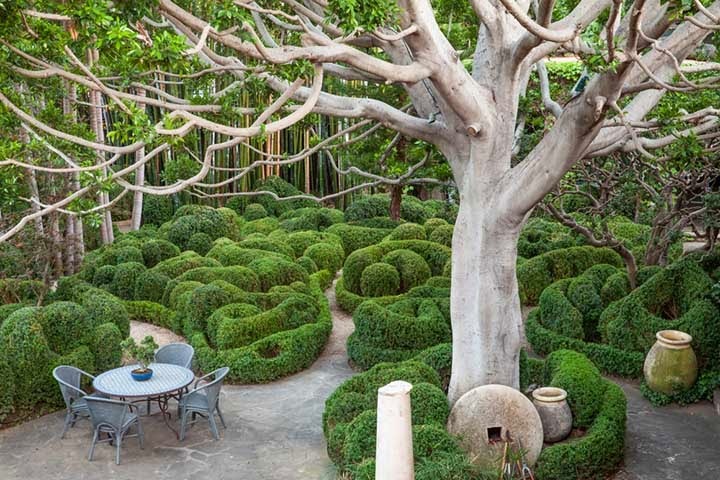 So serene though I can't believe he trims all the boxwood. What a workout! "Sheer heaven, Diane!! Pun intended with love for Richard and every inch of his garden and everything else he touches. He's just divine as is your posting on him today. Grazie a mille! Yes, Richard works on this garden every day…clipping and snipping and cutting and trimming…with special garden tools. 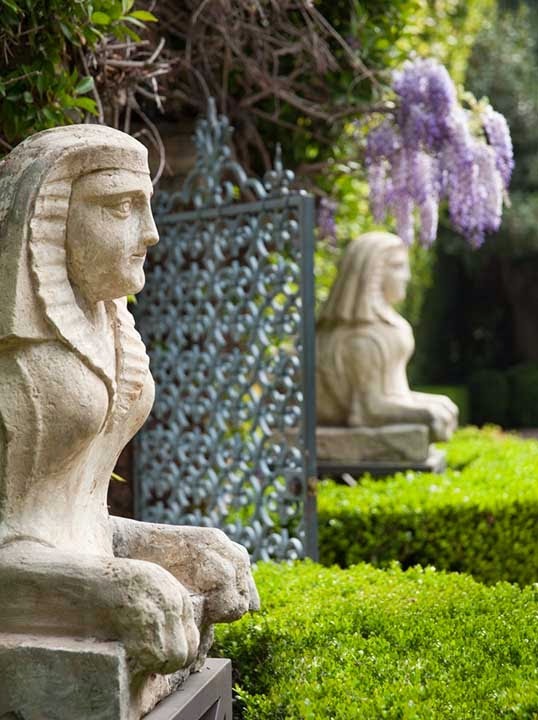 Diane Richard's gardens are an incredible work of art...continuously in progress. Magical, mesmerizing, and mystical! I'm so glad you love THE STYLE SALONISTE and consider it the best of the best. 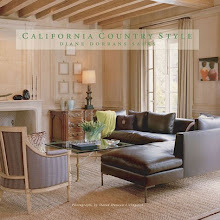 Brian Dittmar is my fantastic art director. And I am the founder, writer, author, fact-checker, self-editor, researcher and email responder and correspondent and office-clean-up person and an ace with the feather duster. Yes, it is true that there are spelling errors and commas that go astray. I often have messages from editors. An amazing number of highly professional editors are among my constant readers--and I often hear from them. I am also an Engish-educated writer, writing in America…so my spelling and grammar ('which' or 'that'…)is not always perfect 'American' but the OED is my god. I'm happy my readers love my blog posts. I love finding great material, great accomplished people and rare expressions of ideas and creativity. That will always be my search, my goal, and my creative endeavor. Thank you so much, and thank you for your comments on FACEBOOK…love every word. Be sure to stay in touch. Much appreciated. 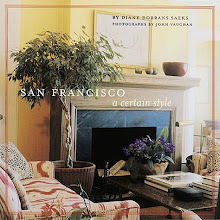 I hope all is well in Orinda and your territory of style and delight. OH!!! I am in a total SWOON!! Lordy! What an exquisite and lovely escape! And I adore that he trims it; I am sure it is a wonderful and healthy psychological exercise!!! This garden is as different as is possible from mine! And you describe it as lovingly and admiringly as you did mine! 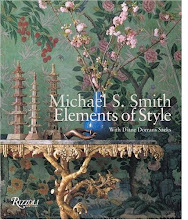 One of your many great gifts as an author!! I bet that he has many birds in that garden! 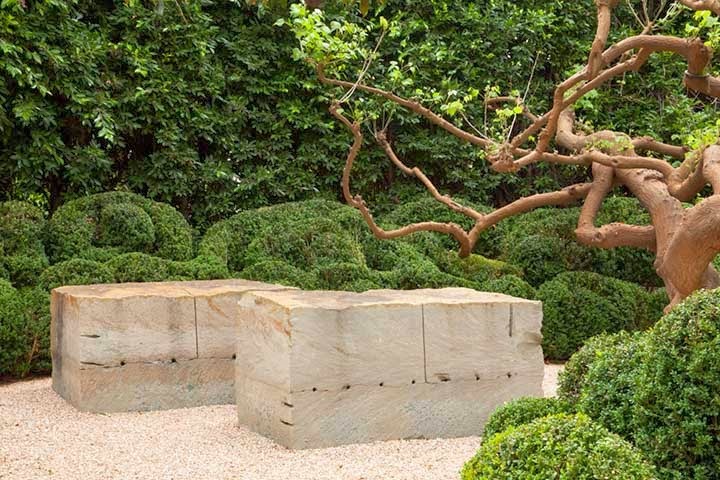 (which has always been a goal of min) who love the "cover" that boxwood provides! It is exquisite; and mysterious, and unusual! The "front lawn"; and the "back lawn" and all those idiotic "annuals" and "Mow, blow, go" ...I cannot even call them gardens!! Tara; you...show what gardens CAN BE!!!! Gorgeous, private, quiet......and lovely beyond! This is on a half-acre!!! Thank you so much! I love the explanation that he "plastered with lime" the stone to "age it"! That lovely lady from Houston wrote a great book about that process! You are the best design blogger in the world! And the most wonderful writer! 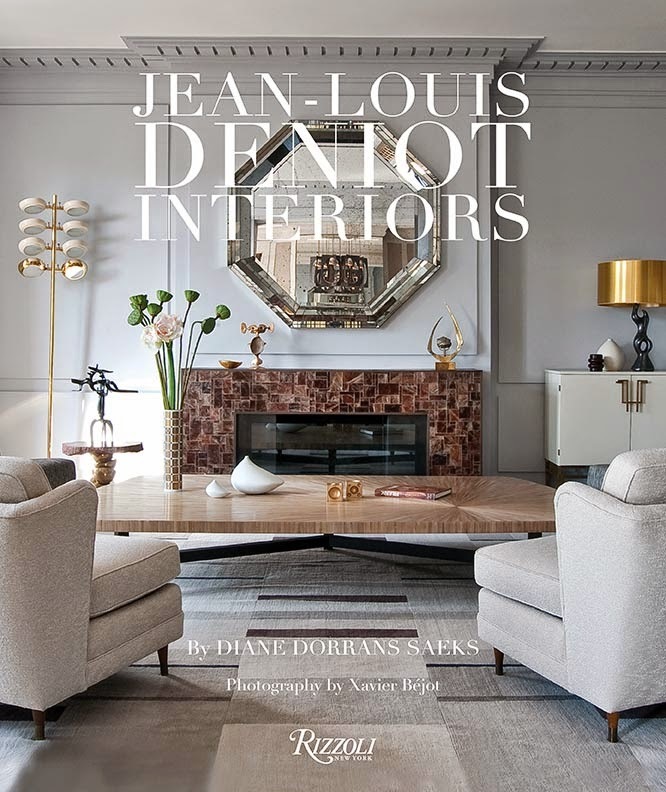 Every single thing I read; I am more grateful and complimented that I am in your beautiful book! 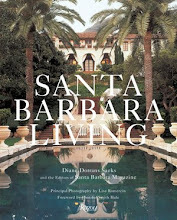 Santa Barbara Style! You interviewed me when I was in airports on my way to Spain to help my daughter with an 8,000 square foot apartment.....with furniture that they would leave there! You are the best writer!! Hi Diane! I was an "English major" in college; and am quite a stickler with grammar; etc. I actually think that was a "spam" post. There isn't one grammatical error in your five or more years of beautifully written; and wonderful posts. Not to mention your 30 or 31 books! I think "spam got through your aksimet" or whatever! I received news today I had inherited 20 million dollars! On my blog! These people are crafty. I feel sorry for them!! You are the best. You have the best house, the best Araucana eggs (that you give to Oprah over the fence), the best husband, the best birds, and the best kids and grandkids…who go sailing up the Mekong. Pretty good. And you are always cheerful and enthusiastic. It is an essential quality--and one you have in great quantities. I love it all. Grammar: I noted to the editor who commented on my editing errors that I am the founder, writer, fact-checker, photo editor, and sole author of the blog. 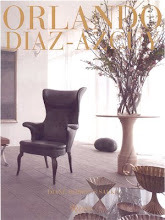 Brian Dittmar is an outstanding art director. I take full responsibility for text and photo selection and any errors are mine alone. I recently completed my 22nd book. I do my best with commas and semi-colons and polish and edit as carefully as possible. I also like a little spontaneity and love vivid writing and vibrant prose. Spirit.